A new doll engages you in repetitive convesrations that have no logic or meaning. 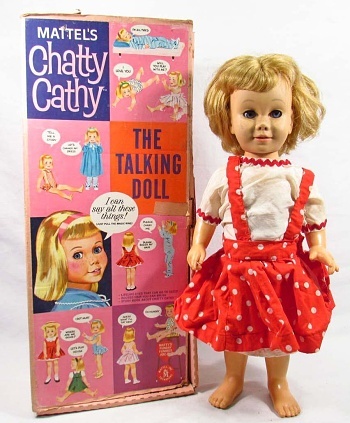 Chatty Cathy: "Won't you take me with you?" Kid: "Mom says I'm grounded." Kid: "Don't you understand? I can't go anywhere!" Gay Guy: "I wonder when Cher will be giving her next farewell concert?" Chatty Extremist Christian: "Your choice to live the Gay Lifestyle is a sin and you'll burn forever in Hell." Gay Guy: "Huh? It's no choice, bozo. I was born this way." Gay Guy: "Didn't you hear me? I said, it's no choice! I sure as heck never chose it!" Gay Guy: "It's not a 'lifestyle'. It's my life! And it's not a choice, you bonehead!" Chatty Extremist Christian: "Won't you take me with you?" A big hit at Jesus Camp, these dolls are pretty much indistinguishable from real Extremist Christians because both seem to want to have a discussion. But they both refuse to listen to anyone but themselves, while quickly accusing everyone who disagrees with them of not listening to them! And along the way, of course, they give real Christians a bad name. Ironically, it's the Chatty Extremist Christians who are doing more to keep people away from Christianity than a century of secular science and materialism was ever able to do. Log Cabin Republican: "Maybe I should just go back into the closet." Oh, please do. It's time for us to just stop pulling their strings, and let them shut up.